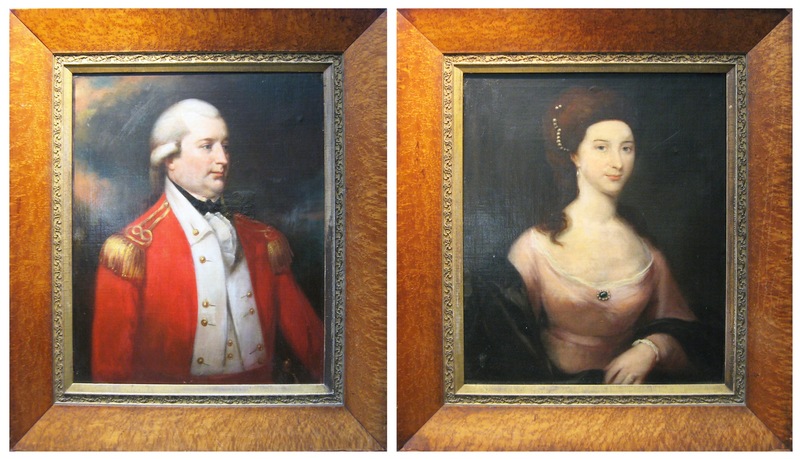 A pair of 18th century oil portraits of Captain William Spaight and his wife Millicent Anne Studdert come up at Hegarty’s sale in Bandon on July 3. A British Army Captain of the 65th Regiment he served at the Battle of Bunker Hill in 1775 during the Siege of Boston early in the American Revolutionary War. The British suffered heavy losses but Capt. Spaight survived. He died in 1801 at his home at Corbally, Co. Clare. The artist is unknown but the portraits are estimated at 2,000-4,000. 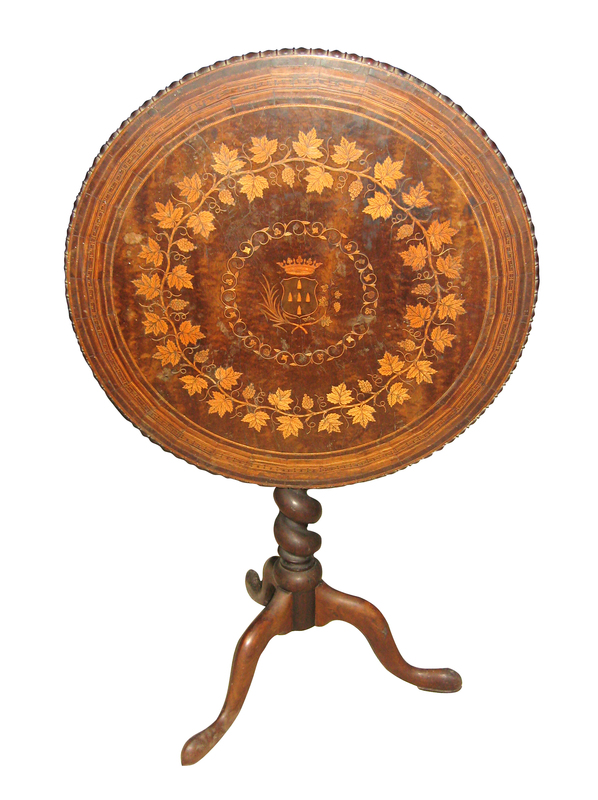 There is a selection of antique furniture including an 18th century Irish side table, a 19th century marquetry longcase clock, an 18th century Irish plate bucket, an Irish Chippendale fold over card table and a Killarney wine table with armorial crest. A Killarney wine table with armorial crest at Hegarty’s sale in Bandon. UPDATE: THIS WAS UNSOLD AND UNDER OFFER. A pair of 18th century oil portraits of Capt. William Spaight and his wife Millicent Anne Studdert. (Click on image to enlarge). UPDATE: THE PAIR MADE 2,100. 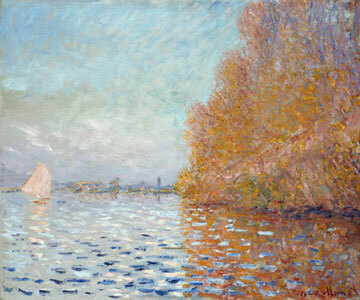 Monet’s ‘Argenteuil Basin with a Single Sailboat’. The only Monet in the collection of the National Gallery of Ireland was deliberately damaged by a visitor today. Claude Monet’s Argenteuil Basin with a Single Sailboat, painted in 1874, was attacked by a man visiting the gallery in Dublin today. The motive for the attack is unknown. The man, in his 40’s, was taken away by ambulance and later arrested. He is now being questioned by gardai. The extent of the damage is not yet clear. The painting, which was bequeathed to the gallery in 1924, was taken away for assessment by the conservation team. 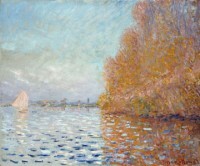 Light and its effect on the surface of the Seine is the subject matter of this painting. Monet moved to Argenteuil with his family in 1871 after returning from London to France. He was joined there in the following years by Sisley, Renoir, and Pissarro. Monet had a boat, in effect a floating studio. A spokeswoman for the gallery described the event as “most regrettable”. 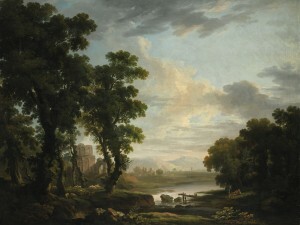 A landscape by George Barret (1728-1784) features at Sotheby’s Old Master and British Paintings sale in London on July 5. Estimated at £60,000-80,000 An extensive Wooded River Landscape, with Shepherds reclining in the foreground and Ruins Beyond is from an Irish private collection. The sale also features a Portrait of a Lady, thought to be Lady Charlotte McDonnell, Countess of Antrim (1779-1835) by Hugh Douglas Hamilton (1739-1808). It is estimated at £30,000-50,000. Both artists were born in Dublin. George Barret was a founding member of the London Royal Academy. Hugh Douglas Hamilton found great success with his pastel oval portraits in London. In 1796 he painted Lord Edward Fitzgerald, the Irish aristocrat and revolutionary. AN EXTENSIVE WOODED RIVER LANDSCAPE, WITH SHEPHERDS RECLINING IN THE FOREGROUND AND RUINS BEYOND. (Click on images to enlarge). UPDATE: THIS SOLD FOR £97,250. 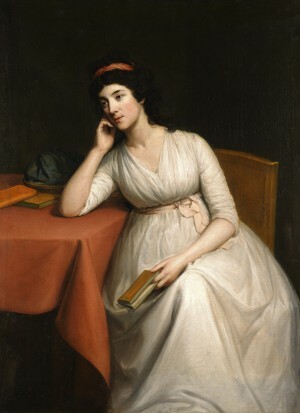 PORTRAIT OF A LADY, THOUGHT TO BE LADY CHARLOTTE MCDONNELL, COUNTESS OF ANTRIM. UPDATE: THIS SOLD FOR £34,850. Small Mirror by Sean Scully. 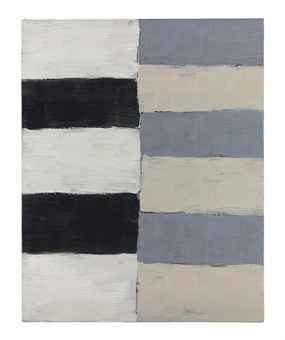 Small Mirror by the Irish artist Sean Scully sold for £91,250 at Christie’s post-war and contemporary day auction in London on June 28. An oil on canvas laid down on board it was painted in 1998 and measures just over 20″ x 16″. 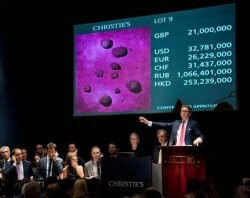 Christie’s day auction realised £15,463,725. The top lot was Andy Warhol’s Jackie 1964, which made £589,250. This followed on from the evening auction on June 27 which made £132,819,400, the highest total for an auction of Post War and Contemporary Art in Europe. At Christie’s the evening and day sales combined realised a combined total of £148,283,725. At Sotheby’s the summer sales of contemporary art, including the Gunter Sachs Collection sold in May, made a combined total of £124.5 million. Despite financial uncertainty buyer’s are still prepared to pay record breaking prices, but only for works of great quality and rarity. Uncertainty about the economic outlook is still hurting the market for lesser works. 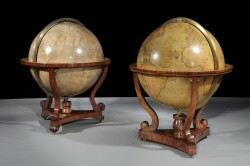 This pair of matched Terrestrial and Celestial library globes is at the Butchoff Antiques stand at Masterpiece. (Click on image to enlarge). MASTERPIECE, now in its third year, is renowned for the rarity and quality of its pieces. The fair, in a spectacular purpose built pavilion on the South Grounds of The Royal Hospital Chelsea, London SW3 from June 28 June to July 4, has ably taken over from the venerable Grosvenor House Antique Fair, which came to an end in 2009. Masterpiece’s stunning debut in 2010 more than compensated for this demise. It established itself in just one offering. With about 160 exhibitors the focus this year is on art, antiques and design. New to Masterpiece London this year are New York dealers Sperone Westwater, Sebastian + Barquet, Siegelson, and Fred Leighton alongside Munich – based dealers Rudigier and Meissen specialist, Robbig. From Norway, the fair welcomes Kaare Berntsen with a stand devoted to Edvard Munch, including an extremely rare print of The Scream, and Hemmerle, also from Munich, add to the already strong jewellery offering with stunning contemporary pieces inspired by Ancient Egypt. Butchoff Antiques is showing an extraordinary pair of matched terrestrial and celestial library globes. The terraqueous globe by John Addison and G. and J. Cary is supported on a San Domingo mahogany stand. It was made in London c1840. The c1845 celestial globe was made in London by Thomas Malby and Son. The scene at Christie’s as Yves Klein’s Le Rose du bleu (RE 22) sold for £23,561,250. A world record for Yves Klein set the seal on Christie’s record breaking Post War and Contemporary Art auction in London tonight. The sale brought in £132,819,400, the highest total for any auction of Post War and Contemporary Art in Europe. The top lot was Yves Klein’s Le Rose du bleu (RE 22), which sold for £23,561,250. This price, which converts to $36,779,111, narrowly pipped the $36,482,500 achieved for Klein’s FC1 at Christie’s in New York in May. 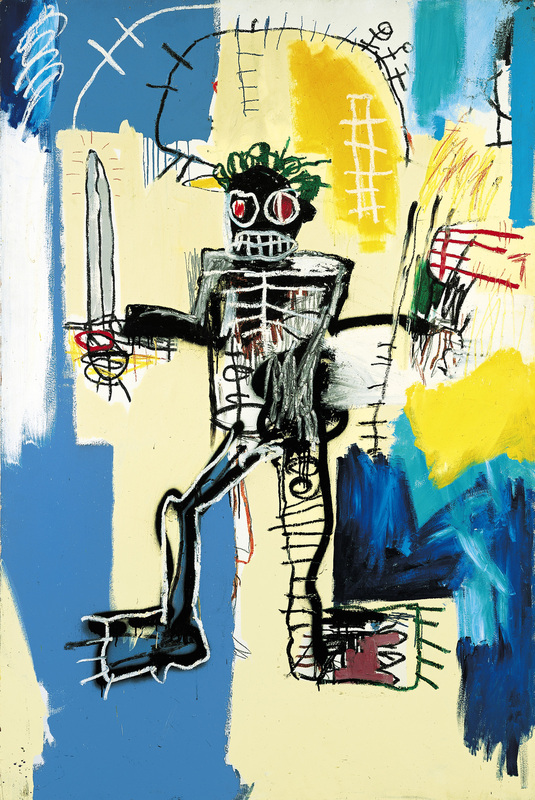 In total four lots sold above £10 million, 21 sold for over £1 million and record prices were established for David Altmejd, Jean-Michel Basquiat, Marcel Broodthaers, Yves Klein and Beatriz Milhazes. A Study for Self-Portrait painted by Francis Bacon in 1964 sold for £21,545,250, an untitled work by Basquiat made a record price of £12,921,250, Gerhard Richter’s Struktur 2 made £12,697,250 and Rouge triomphant, Alexander Calder’s largest hanging mobile ever sold at auction made £6,201,250. Francis Outred, Christie’s Head of Post-War & Contemporary Art, Europe: “Following the record result achieved at Christie’s New York in May, we are delighted with tonight’s results which established a new record for an auction of Post-War & Contemporary Art in Europe. Totalling more than £132.8 million, at the foundation of the auction’s success were five masterworks by Yves Klein, Francis Bacon, Jean-Michel Basquiat and Gerhard Richter. The price for the Bacon was particularly satisfactory following the discovery that this self-portrait carries the body of Lucian Freud. Overall we brought together consignments from four continents, reached buyers on four continents and benefitted from a depth and strength of bidding from across the room and on the phone”. (See posts on antiquesandartireland.com for May 29 and April 4 2012. This ivory silk gown with bodice embellished with silverpaste and glass beads, The Girl who lived in the Tree by Alexander McQueen, Autumn/Winter 2008-9 and a photograph by Mat Collishaw for Harper’s Bazaar, UK 2012, made £85,250, a world record price for the designer at auction. The auction of the Daphne Guinness Collection made £476,800 at Christie’s, South Kensington, on June 27. This was four times the pre-sale estimate. 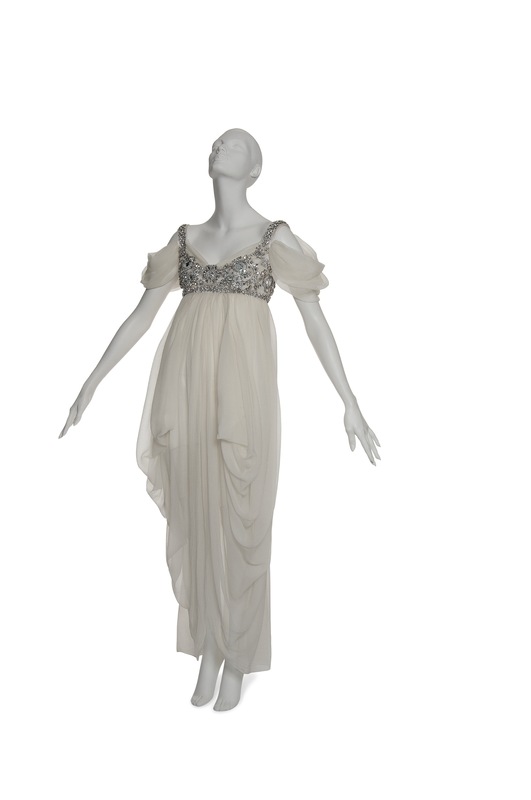 Sold to benefit the Isabella Blow Foundation the auction offered 102 lots, including a selection of dresses, coats, skirts, tops and jackets belonging to Daphne Guinness, as well as selected photographs and her signature shoes. The top lot was a photograph by Mario Testino for British Vogue. It made £133,250, a new world record price for the photographer at auction. 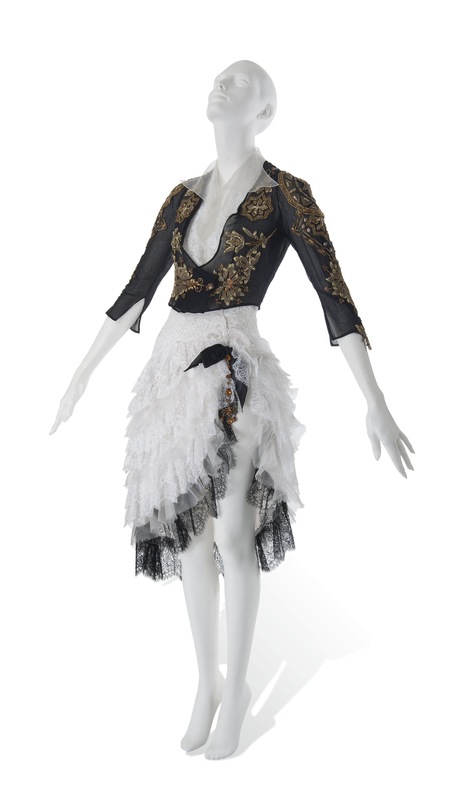 This Spanish-style white lace dress with black matador jacket by Christian Lacroix made £16,250, a world record price for the designer at auction. The top dress was an ivory silk tulle empire line gown, The Girl Who Lived In The Tree by Alexander McQueen, Autumn/Winter 2008-9. Sold with a photograph by Mat Collishaw for Harper’s Bazaar UK, May 2012, it made a world record price for the designer at auction of £85,250. There was a record at auction for designer Christian Lacroix whose Spanish style white lace dress with black matador jacket made £16,250. Images courtesy Christie’s Images Ltd., 2012. Click on either one to enlarge it. (See post on antiquesandartireland.com for June 11, 2012). 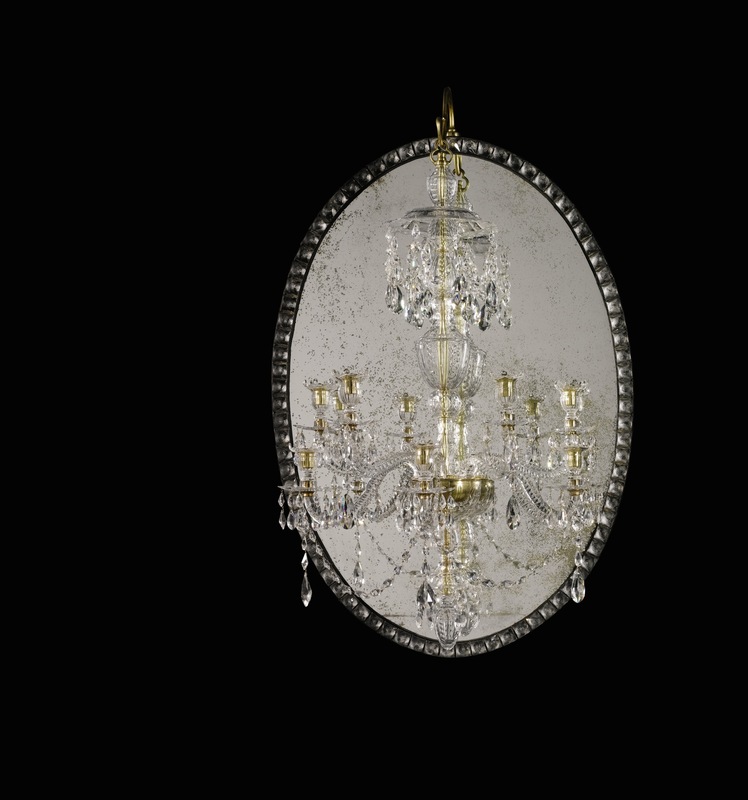 An oval George III Irish cut glass mirror chandelier comes up at Sotheby’s Arts of Europe sale in London on July 3. 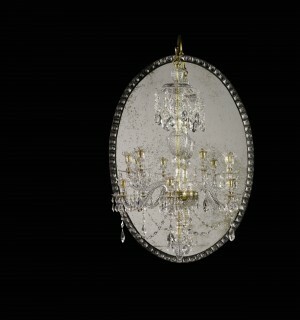 Made c1790 the mirror has a border of faceted drops and the chandelier has seven lights. It is estimated at £40,000-60,000. 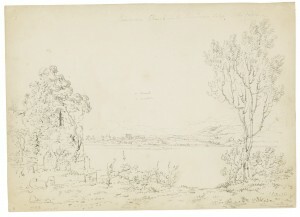 A folio of Irish landscapes by John Laporte comes up at Sotheby’s Old Master and British Drawings sale on the following day. 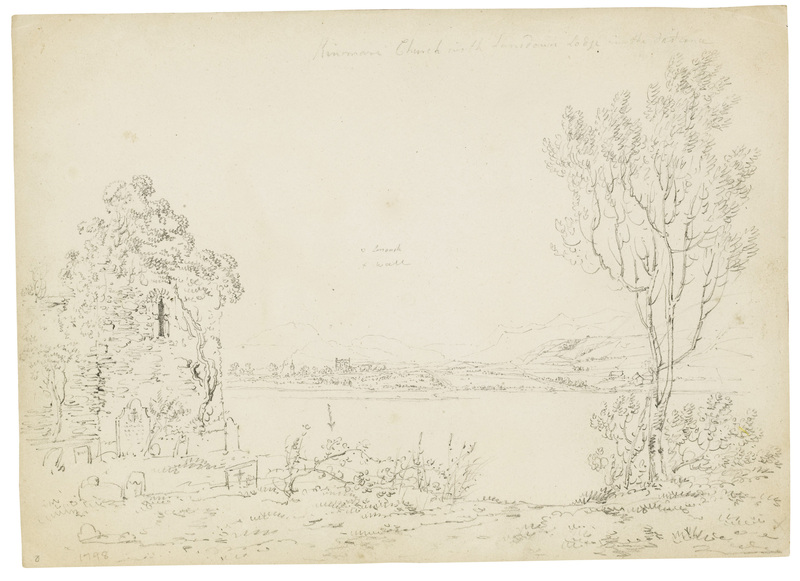 The 62 pencil and one pen and ink works in the folio include views of Belleek; Muckross Abbey; Killarney Lake from Innisfallen; Kenmare Church with Landsdown Lodge in the distance; Turk Lake, Killarney; Glenflesk near Killarney; the Brickeen Bridge, Killarney; the Ardtully Bridge on the Rowdy River; Blackwater Bridge; Loch Derg and the Dublin Lighthouse. One is dated July 31, 1798, another is dated just 1798. The estimate is £3,000-6,000. An Irish George III mirror chandelier at Sotheby’s. (Click on image to enlarge). UPDATE: THIS MADE £49,250. One from a folio of Irish landscapes by John Laporte , born in Dublin in 1761, died London 1839. (Click on image to enlarge). UPDATE: THIS WAS UNSOLD. 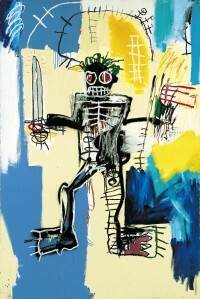 BASQUIAT’S Warrior topped Sotheby’s evening sale of contemporary art in London on June 26. It made £5,585,250 in a sale which realised £69.3 million. Glenn Brown’s The tragic conversion of Salvador Dali made £5,193,250, a record for the artist at auction. Bacon’s 1980 Study for Self-portrait sold for £4,521,250 and Gerhard Richter’s Jerusalem made £4,241,250. In all 21 works sold for over one million pounds in a sale with sell through rates of 87.3 per cent by lot and 93.4 per cent by value. Sotheby’s Summer Season of Contemporary Art Sales in London has brought in a total of £110.7 million. A total of 8% of works were bought by clients new to Sotheby’s. Bidders from 15 countries participated. A total of 21 works sold for over £1 million, and 26 for over $1 million; eight works sold for over $4 million and four for more than £4 million. (See posts on antiquesandartireland.com for June 14 and June 10, 2012). 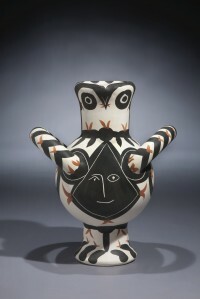 THERE was a world record for a Picasso ceramic at the sale of the Madoura Collection at Christie’s, South Kensington. 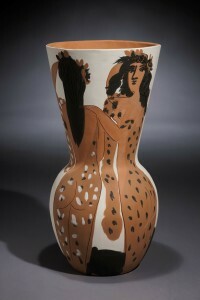 Grand vase aux femmes voilées made £735,650. Conceived by Pablo Picasso (1881-1973) in 1950 it was executed in an edition of 25. The vase sold more than ten times the estimate. 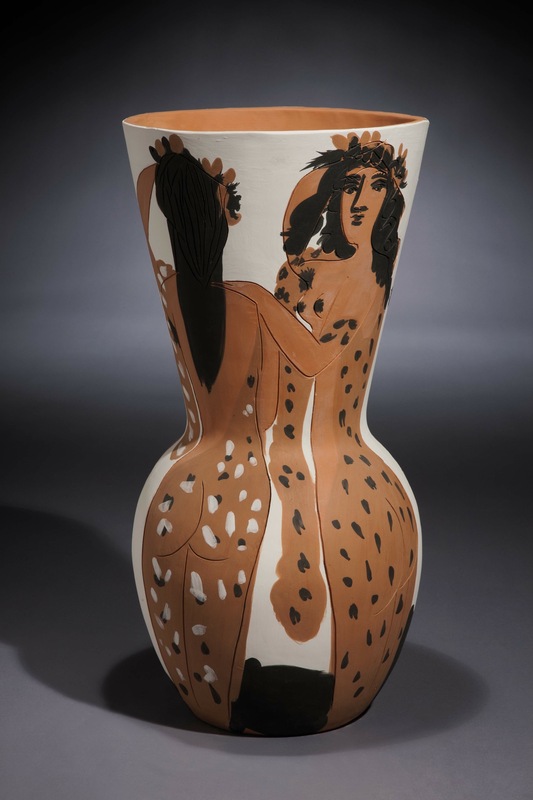 The previous record for a Picasso ceramic edition at auction was €312,750. The sale of 543 lots realised £8,082,300, more than four times pre-sale expectations. Nearly 500 clients registered to bid and buyers came from 43 different countries. The auction was 100 per cent sold and four works exceeded the previous record set in December 2010. (See post on antiquesandartireland.com for April 1, 2012). 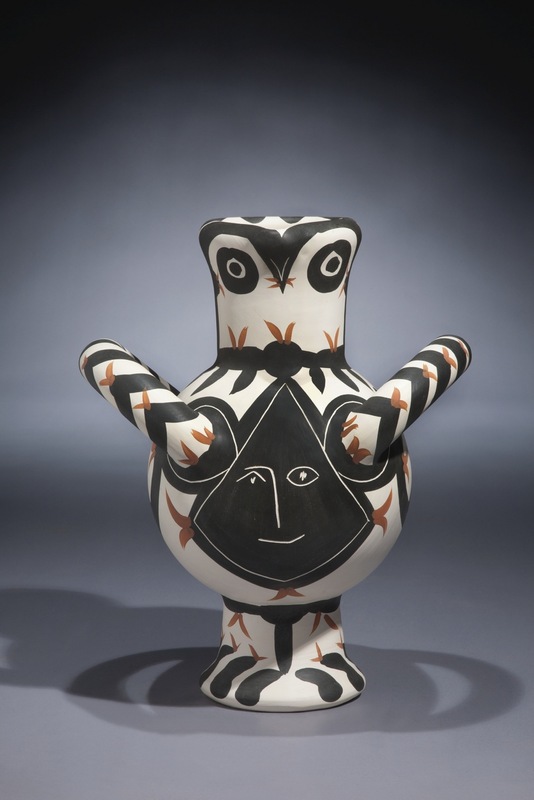 Gros oiseau visage noir made £289,250. Image courtesy Christie’s Images Ltd., 2012. (Click to enlarge). 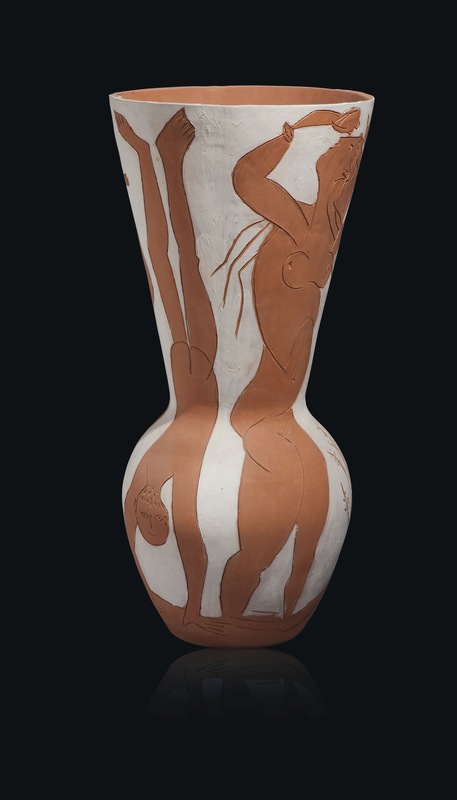 Pablo Picasso (1881-1973) Grand vase aux femmes voilées made £735,650. Image courtesy Christie’s Images Ltd., 2012. (Click to enlarge). 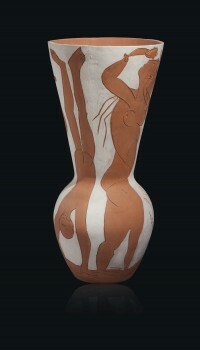 Grand vase aux danseurs made £265,250. Image courtesy Christie’s Images Ltd., 2012. (Click to enlarge).